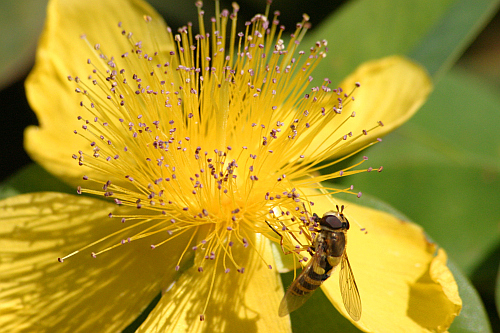 Light, fine and briskly, a syrphe gathers pollen from this St-John's-wort in a garden somewhere in Picardy. In 2004, three villages of the Somme departement obtained the highest prize of « Most Flowered Cities and Villages » with 4-flowers: Doullens, Forest l'Abbaye and Guyencourt-Saulcourt. Amiens, the regional capital, is also listed with an honourable 3-flowers distinction.